At a keynote held today in Cupertino, Apple's Senior Vice President of Worldwide Marketing Phil Schiller officially introduced the iPhone 5s, the successor to last year's iPhone 5 and the major new entry in the iPhone line-up. Schiller referred to it as the "most forward-thinking phone anyone has ever made". As widely expected, the iPhone 5s has the same industrial design of the iPhone 5, with an anodized aluminum back and diamond cut chamfered edges and glass inlays, 4-inch Retina display, and Lightning connector. However, the iPhone 5s comes with a visible change in the Home button: through a brand new system called Touch ID, a sensor available under the Home button will allow iOS to recognize a user's fingerprint for authorization and security purposes. The iPhone 5s shares the same design of the iPhone 5, but the Home button has been redesigned to also act as a fingerprint scanner for the Touch ID feature. According to Schiller, in spite of the passcode functionality available on modern smartphones, half of smartphone users don't bother setting one. Apple saw that as a security problem that could be improved, and decided to embed a fingerprint sensor into the Home button, surrounding it with a stainless steel detection ring. Apple's sensor can read a user's unique fingerprint, analyze it and categorize it based on three different types of human fingerprints, and use it to better protect an iPhone. The 5s' sensor is 170 microns thin, has a resolution of 500 ppi, and it can read a user's fingerprint on any orientation at 360 degrees. The sensor is capacitive, and the new Home button is made of sapphire crystal that won't be scratched after prolonged use. The detection ring isn't simply an aesthetic choice: iOS 7 uses it to turn the sensor on and start the print-reading process, so that battery life will be preserved by not activating the sensor when it's not needed. iPhone 5s sets a new standard for smartphones, packed into its beautiful and refined design are breakthrough features that really matter to people, like Touch ID, a simple and secure way to unlock your phone with just a touch of your finger. The iPhone 5s will use Touch ID to let users easily and naturally unlock an iPhone without typing a passcode, just by placing a finger on the Home button. Touch ID can handle multiple fingerprints, which are never backed up to iCloud or stored on Apple's servers: instead, they are encrypted and stored securely in the Secure Enclave on the iPhone 5s' new A7 processor. In a demo shown on stage, Schiller explained the new Touch ID authentication features built into iOS 7, such as a seamless authorization process for the iTunes Store that doesn't require a password for new purchases. The iTunes Store, App Store, and iBooks Store will allow iPhone 5s users to authorize puchases just by placing a finger on the Home button. In a video posted on the company's website, Apple's Jony Ive and Dan Riccio explain the inner workings of Touch ID, describing how the sensor can analyze the patterns of human fingerprints -- which are always unique for each person -- and learn from these patterns to get smarter (and faster) over time at unlocking a phone or authorizing a purchase. The demo video shows a quick (less than 2 seconds) unlocking process for Touch ID, as well as a new area in the iOS 7 Settings app to add and manage fingerprint images. 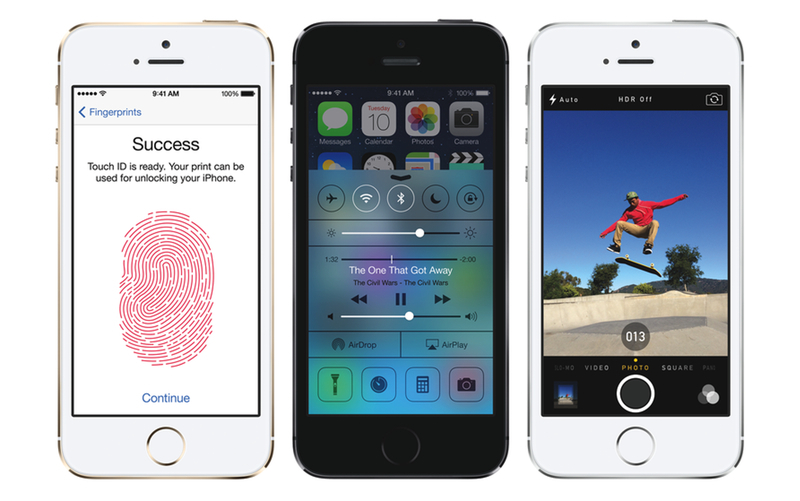 The iPhone 5s is twice as fast than the iPhone 5 thanks to Apple's new A7 processor. Almost every functionality, from launching the Camera or Music to viewing email attachments or saving photos is now twice as fast on average. The A7 is the first 64-bit iPhone chip, and the 5s is the first smartphone in the world to have a 64-bit architecture. Apple has fully re-engineered iOS 7 to run at 64-bit, but Apple has also ensured that the iPhone 5s will be capable of running both 64-bit and old 32-bit apps. Every built-in Apple app has been reworked for the 64-bit CPU, and iOS 7 now offers native 64-bit libraries and kernel. Support for 64-bit will be built into Xcode so developers will be able to transition their apps to the new architecture. iPhone 5s delivers incredibly rich and complex visual effects, previously only possible on Macs, PCs and gaming consoles. With the A7, Apple says that doubled performances will be easily seen in common tasks like saving videos and playing games. The A7 supports OpenGL ES 3.0, and its graphic capabilities (according to Apple, 56x faster graphics than the first 2007 iPhone) were showcased by Infinity Blade III, announced and demonstrated on stage today. Alongside the A7, the iPhone 5s will include a new motion coprocessor called M7. The M7 chip continuously measures motion data using the built-in gyroscope, compass, and accelerometer, identifying a user's position and movement such as "standing and walking" or "running". This information that the M7 provides to the operating system can be used by third-party apps through the new CoreMotion API, which will allow developers to built more capable health and fitness apps. The M7's optimization is based on contextual awareness, meaning that developers will also get access to motion information related to position and movement. According to Apple, the M7 will be power-efficient and gather data even when the iPhone 5s is asleep. By offloading work that would typically fall onto the CPU, the M7 is a "sidekick" that can make apps that use all the accelerometer all day consume less power while proving more accurate data thanks to Apple's algorithms and APIs. Another upside of contextual awareness is that Apple apps will use the M7 coprocessor in interesting new ways. For instance, the iOS 7 Maps app will be able to automatically switch from driving to walking directions if you park your car and continue on foot; or, when driving, the iPhone 5s will understand that it's in a moving car and it won't ask to join WiFi networks. If the M7 tells the iPhone 5s that you're likely asleep because the iPhone hasn't moved in a while, network ping will be reduced to increase battery life. Today, Apple announced that Nike will be one of the first developers to take advantage of the M7 and CoreMotion API with an app called Nike+ Move. The iPhone 5S' camera received numerous improvements on both the hardware and software sides. First off, a new, Apple-designed five-element lens features 2.2 aperture with a sensor that has a 15% larger active area. The camera has always been one of Apple's core priorities for the iPhone, and it's no surprise that the 5s offers powerful and meaningful improvements. Thanks to the new sensor, the iPhone 5s' camera can capture bigger pixels, which, ultimately, produce better pictures. The all-new 8 megapixel iSight camera features a larger f/2.2 aperture and a new, larger sensor with 1.5μ pixels for better sensitivity and low-light performance, resulting in better pictures. These improvements, along with the Apple-designed image signal processor in the A7 chip and the new Camera app in iOS 7, provide up to two-times faster auto-focus, faster photo capture, automatic image and video stabilization, and better dynamic range. The iPhone 5s comes with a dual LED flash system that separates the camera flash in two different LEDs: one is cool and white, the other amber and warm. By automatically balancing light emitted by the LEDs, iOS 7 can take better photos through 1,000 unique variations of the combined flash lights. A practical implementation of the dual LED system is that, by mixing white and amber lights, skin tones should look better and more natural. The feature is called True Tone flash. When you take a picture with the flash enabled, the iSight camera uses software algorithms to assess the color temperature of the scene. That allows iPhone 5s to determine just the right percentage and intensity of white light versus amber light you need — using over 1000 unique combinations. The result is a beautiful shot with more true-to-life colors. Not too cool. Not too warm. Better highlights. More natural-looking skin tones. The iOS 7 Camera app packs new features, too. A new Burst mode is built into the app and lets iOS 7 capture up to 10 photos per second; pictures are analyzed in real time, and the best individual shots (or a sequence) are automatically suggested by the OS. For video, a new slow motion mode called Slo-Mo will allow users to capture HD video at 120 frames per second; Slo-Mo videos can be played back at a quarter of the original speed for a "dramatic effect". Automatic image stabilization and live video zoom up to 3x are also supported by the iOS 7 Camera on the iPhone 5s. The FaceTime HD camera has been upgraded with larger pixels and an improved backside illumination sensor; on iOS 7, the iPhone 5s will support FaceTime audio for audio-only calls. The iPhone 5S comes with three different metallic finishes: silver, a new gold option, and what Apple calls "space gray". The design is the same of the iPhone 5, and the Home button's ring matches the metallic finish of the device. For the iPhone 5s, Apple has made new leather cases that complement the device beautifully. Available in brown, beige, black, green, yellow, blue, and red and at $39 each, the cases are made of premium leather and they "look and feel luxurious". The cases cover the volume buttons but have cut-outs for the camera and power button; they protect the back of the iPhone 5s, and they are also compatible with the iPhone 5. Battery life on iPhone 5S has been improved from the iPhone 5, as it now allows for 10 hours of 3G talk time, 10 hours of LTE browsing, 10 hours of WiFi browsing, 10 hours of video, and 250 hours of standby. The iPhone 5s supports 13 different LTE bands. A webpage with technical details is available here. iPhone 5s will be available in the US, Australia, Canada, China, France, Germany, Hong Kong, Japan, Puerto Rico, Singapore and the UK on Friday, September 20. With a press release, Apple has confirmed that the iPhone 5s will be available on NTT DOCOMO in Japan on September 20. According to Apple, the iPhone 5s will be available in 100 countries and on 270 carriers by the end of 2013. Apple has posted a dedicated webpage for the iPhone 5s' Camera here. Examples photos taken with the iPhone 5s can be viewed here. For the complete list of LTE-ready bands and country details, Apple has an official webpage here. Apple has updated their Accessories webpage for the new iPhone 5s and 5c accessories. 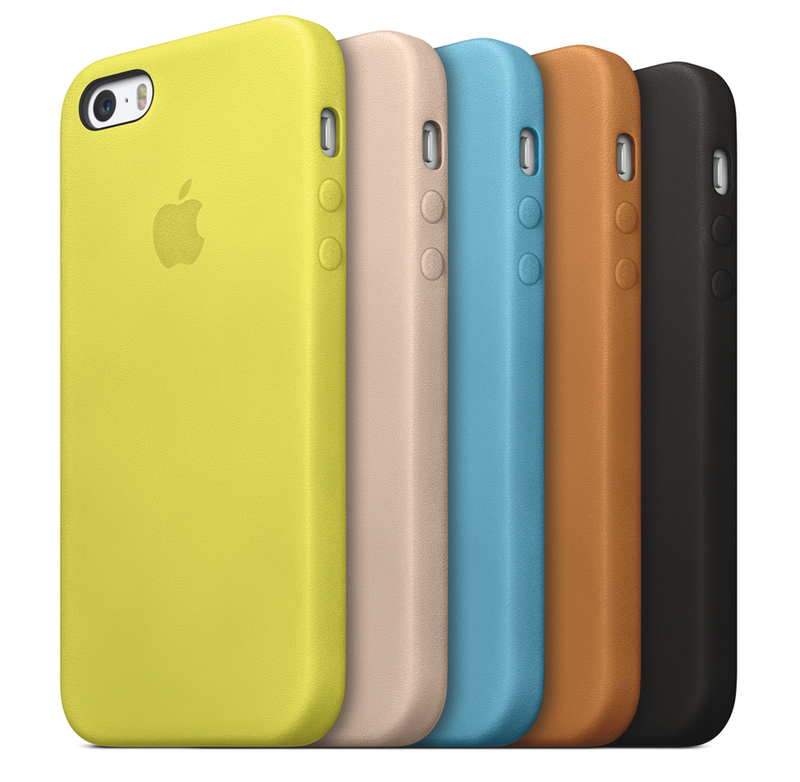 By going here, you'll be able to virtually try the new colored cases on the various color combinations of the iPhone 5s. The Accessories webpage also shows the new iPhone 5s dock, introduced today on the Apple online store. Unlocking the iPhone 5S was very slick—just rest your finger on the Home button and the phone unlocks immediately. You don’t have to press or move your finger around waiting for it to be recognized—it just worked. MG Siegler has posted a photo gallery of the iPhone 5s, showing the new, non-concave Home button. Tim Bradshaw has posted a Vine video showing how the iPhone 5s registers a new fingerprint with Touch ID. The setup process with the iPhone 5S is fairly straightforward, with graphics and text-based instructions to guide you through. Essentially you spend some time letting the sensors in the Home button get used to your fingerprint, moving your finger around slightly, lifting it up just above the surface and putting it back down, with a graphic filling out how near the software is to being able to recognize your fingerprint (you can use thumb or index finger, depending on your preference). The process took about 30 seconds to a minute overall, and then once it had successfully identified by fingerprint, it worked flawlessly to unlock the device for every subsequent trial. It also readily rejected Greg Kumparak’s attempts, proving that it isn’t just accepting all comers. Make sure to check out Etherington's post, as it includes more first impressions on colors, device speed, and camera improvements. Luckily, it still maintains a nice, tactile feel when you click on it and we don't foresee anybody running into any issues. We watched the fingerprint sensor unlock the phone quickly and easily (though we didn't get to try it ourselves), but presumably these were ideal conditions with iPhones that were fully acclimated to their handlers. That's not to say we don't think the fingerprint will be a great and fast experience for most users — Apple has clearly put more effort into this sensor than the failures we've seen on some Android phones — but we can't vouch for it until we've tried it ourselves. SlashGear's Chris Davies says that the iPhone 5s feels like a "solid" upgrade from the iPhone 5, and he posted two hsnds-on videos of the device on YouTube. In a separate post, Davies notes that the 5s' leather case feels both "slim and secure", noting how Apple's leather-coloring process should make the case feel more rugged over time. Below, a 7-minute hands on video, courtesy of AnandTech. The device in this video is a white & gold iPhone 5s. We taught a 5S to learn our fingerprint, which takes place in the settings menu. iOS 7, which is what all 5S models ship with, prompts you to roll your finger of choice around the home button. Slowly, and on-screen, an image of a fingerprint is built up. In our first look it took about 15 seconds of finger prodding for the phone to determine an accurate print from various angles, after which we could unlock the phone by placing our digit on the home button. It's hard to argue this doesn't work well. For more coverage, check out our September 10 news hub and follow @macstoriesnet on Twitter.